Some people seem to think that structural certification merely comprises of viewing drawings of a proposal and then “rubber stamping” the drawings as structurally adequate (eg. they have turned up at the office, and expected we stamp and approve there and then.). Certification seems to be sought to save time and money. The process can only save time relative to structural calculations, and structural design, if and only if the proposal is actually structurally adequate. Structural design involves producing drawings and calculations, producing a full specification of structural requirements, assessing suitability of purpose, and iterating in several cycles of drawing,calculations until find something which is suitable for purpose. Providing structural calculations requires that someone else has produced all the drawings that I would require to fully define the proposal so that each feature can be assessed for fitness for function. As with structural calculations, certification also requires someone else produce a full set of structural drawings, and calculations are carried out, however the calculations are not formally written up. In the past I did such calculations on scrap paper, first in pencil, then reworked in blue ink, then red, and possibly again in green. if still not found a suitable answer then would start a new set of calculations in pencil again. Formal calculations only document the set of calculations which present the final solution. With pressures of time all calculations become final calculations, and all the ways something doesn’t work get issued. If calculations produced on scrap paper and reasonably neatly presented, then they could be photocopied onto formal calculation sheets and issued as formal calculations if needed. With the use of pocket calculators, and computers calculation becomes a process, which does not automatically generate a report. As mentioned in an earlier post spreadsheet calculations are quick to work through if use on a regular basis, but time consuming if use on an irregular basis. This goes for the producer of the calculations and those conducting an independent review. For example a shed design spreadsheet creates consistency in presentation of report and the detail of assessment. In the first instance the person reviewing such report may take a few hours to check the report, but there afterwards they can review in a few minutes: they just look for critical items in the report and check those. The design process is iterative and so is assessment. The following figure presents the model of design I was taught. 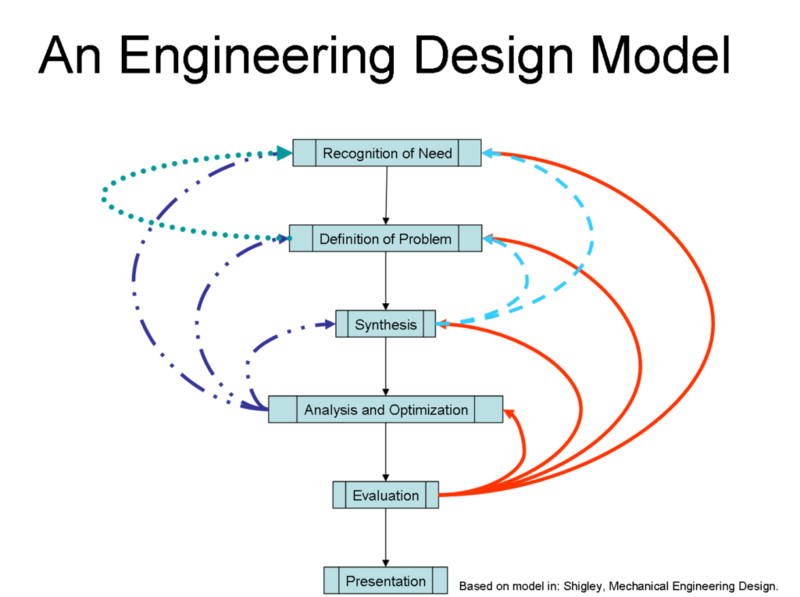 Design Model from Shigley Mechanical Engineering DesignWhilst there is a common forward thread from one step to the next, each step also has a feedback loop returning to the previous steps. when it comes to structural certification, then basically someone else has done all the steps leading to the evaluation step. That is they reach the evaluation step for the first time, and everything they have proposed and documented to that point has been proposed without any evaluation. When an engineer, industrial product designer. engineering technologist, or engineering associate (Associate technologist) carries out design they do so, in small incremental steps evaluating each small feature before moving to the next: oscillating between an over all view and a small detail view. Design takes place on a drawing board, and being able to move between drawing and calculation is typically more efficient than division of labour between two people, such as between drafter and engineer. Mere assessment could be considered as a single iteration, but it isn’t. Whilst design requires multiple iterations through a sequence of calculations to find components suitable for purpose, independent assessment could be considered as only requiring one iteration through the calculations to confirm the specification. However such argument assumes that there is a clearly defined sequence of calculations and always have time to carry out all calculations. There isn’t a clearly defined sequence of calculations, each designer determines their own sequence of calculations around a set of common principles. Time is not always available to carry out detailed extensive calculations. Council engineers for example along with engineers employed by private certifiers, certainly do not have adequate time to do detailed extensive assessment, and they don’t. The designer is the person ultimately responsible for fitness-for-function, not some regulating authority. I consider that engineering takes place at the frontiers of science and technology. Engineering is a high risk activity making decisions based on incomplete knowledge, with highly uncertain outcomes. When a regulating authority requests engineering, they are expecting to minimise risk, have decisions based on near complete knowledge and have certain outcomes. They really don’t want engineering, or have need for engineers: unless engineering is a simple name for a process of rational scientific design: in which an engineer is anyone with adequate education in science and its application for design. When it comes to regulations, and codes of practice, then moved away from design, and become more of a technical lawyer. Rather than arguing that something is fit-for-function, end up arguing that something is compliant with a code of practice. For example something would be fit-for-function if it could support a load of 1.1kN, however it would only be code compliant if it could support a load of 1.5×1.1= 1.65kN. Codes are not created to ensure high quality, but to permit low quality. Cynically code compliant typically indicates that something is considered fit-for-function by some long dead committee. It should also be noted that high quality is not the same as high performance: quality is a measure of meeting needs, and conformance to specifications. If high performance specifications fail to meet people’s needs, then conformance with such specification has the nett effect of being low quality. A good designers first task therefore is not mere compliance with codes of practice, but determining the case by case specifics for fitness-for-function, and determining if the mandated codes of practice are adequate or otherwise overkill. If a structure or any other product fails in some way, then chances are there will be a coroner’s inquest. The designer will then have to defend their design, demonstrate that their design was suitable for purpose. If the product failed, then the common perspective will be that it wasn’t fit-for-purpose. The task therefore becomes defining the purpose, and identifying that the failure was a consequence of misuse. All individuals are responsible for their choice of purpose to which they put things. Sometimes it may not be clear if a product is suitable for a given purpose, but in such situation, an individual has a responsibility to proceed with caution: to experiment, to “test the water”. If necessary they may need someone else to assess suitability, and make the decisions for them. However, another person acting as designer can only make a reliable decision, if the person wanting the product has provided a full and proper specification of their needs and requirements. Depending on circumstances a designer may ask more questions than the future owner of a product may consider necessary: these questions are however necessary to make a rigorous assessment of suitability. Under the national construction code (Building Code of Australia) (NCC/BCA), the person putting forward a proposal is considered to be the building proponent. A building proponent however is not necessarily capable of defending their wants and requirements: they are neither familiar with the NCC/BCA, its referenced standards, nor the science required to demonstrate compliance. What they need is a technical lawyer or Advocate. Such advocate is capable of evaluating a building proposal using a rational scientific process. We can consider the relationship between the individual wanting to develop their property and city council as similar to that of a court, only a more desirable court than a coroners inquest. The role of engineer, technologist, or associate technologist, is that of advocate. They are the people who can justify and defend the technical decisions they make. They don’t declare that a 140×45 F7 rafter is required because it seems like a good idea this week, and my neighbour used such for their verandah. The technologists decisions are based on a consistent set of rules, derived from the laws of physics: typically mechanics. The rules only change if scientific enquiry suggests they need to be. However design is a subjective activity, and suitability-of-purpose is also subjective. The mechanics of materials for example, to provide a structural element fit-for-function, requires the stress induced in a material be less than the maximum stress the material can resist before fracture. It is a matter of opinion however as to whether we should keep the induced stress less than 80% of the maximum stress or less than 45% of the maximum stress. Add to this the complication that we don’t actually know the stress which will cause fracture, until we actually break the structural element: at which point it won’t be any use for anything. So we can only have a statistical estimate of the strength of the material. Similarly we don’t really know what the magnitude of the induced stress is, or the cause of the stresses which may be induced. Once again we only have a statistical estimate of those loads which are most likely to be experienced. The less certainty we have of the material strength the smaller we make the capacity reduction factor, and the less certainty we have about loads the larger we make the load magnification factor. So for example a code requirement may typically require 1.5M<=0.9fy.Ze, but for a given project the specifics of its requirements may require this is adjusted to 2M<=0.6fy.Ze. The load is magnified by larger design-factor, or factor-of-ignorance because the load is too variable, and the source of the load lacks adequate control. Whilst the strength reduction factor is lower because the manufacturing process is far too variable and uncontrolled to achieve required consistency. So once again mere compliance does not equate to fit-for-function: code compliance is not a valid defence or justification of a designs fitness-for-function, most especially after failure. A design advocate therefore is not simply demonstrating code compliance: they defend and justify fitness-for-function on the basis of science. The science gives rises to a mathematical model, and such model requires working through a sequence of calculations. Calculations require valid input, basic data about the properties of materials. In the expression 0.9fy.Ze, no numerical evaluation can occur unless know the magnitude of fy, and Ze, these are the two input parameters to the expression. No valid values for these properties, then no valid calculations. There is an expectation that business supplying structural materials publish these material properties. If such data is not published then users need to conduct the tests themselves to determine such properties, or otherwise calculate from other published properties. So the design advocate would accumulate such necessary data on a regular basis, and seek it out on a project by project basis where necessary. They then use this general data, along with project specific data to assess fitness-for-function by conducting suitable calculations. As I was suggesting above assessment or evaluation is still an iterative process, even though we have what appears to be a finished specification. The iteration is a progressive refinement of the analysis models, starting at rough and approximate to the more detailed and realistic. Whilst this is doubly pitched, can still consider the canopy as nothing more than a simple line element, and ignore horizontal loading. It thus becomes a single span, simply supported beam, experiencing either uniformly distributed loads (UDL) or point loads. As a first estimate we also ignore the self-weight of the structure, as we don’t know what the structure is when designing: when assessing something we have a specification from which we can work out the weight, however weight is typically small relative to other loads so ignored in first pass. So simply supported beam, can get maximum moment in the span from M=wL^2/8 for UDL, or M=PL/4 for a point load. So thus far we have L=8.9m, but we don’t have any values for “w” or “P”. A starting point could be as defined in the following table. Wind load is the largest of those values so we start with that. However qzu is the site reference pressure, it doesn’t provide the pressure on a given surface of a structure, for that need a value for the pressure coefficient (Cpn). I could look that up in AS1170.2, but doing a quick check so start with Cpn=1.2, only a few instances will result in a larger value of Cpn. To get a UDL from a pressure also need a load width. In this particular situation the load width for a typical rafter is 3.5/3=1.167m, whilst for the gable end rafter it is 1.667/2=0.583m. So the UDL’s become w=1.2×1.5×1.167=2.1 kN/m, and for the end frame w=1.2×1.5×0.583=1.05kN/m. Therefore the maximum moment is M=wL^2/8= 2.1×8.9^2/8=20.79kNm. Which of the top of my head seems larger than any piece of timber is capable of. Still need to look at either design capacity tables for timber, or use some quick calculator to get the capacity of some proposed piece of timber. I tend to produce vba code for structural calculations to codes, then generate quick calculator spreadsheets, and also design capacity tables. 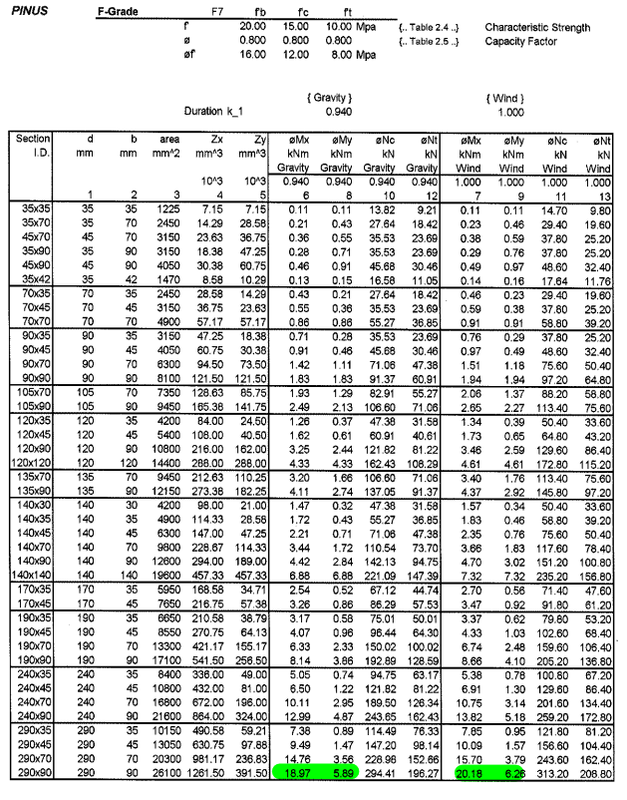 I have released some design capacity tables for timber to AS1702:1997 here. Whilst a quick calculator for timber checks is available here. Both require update of materials to AS1720:2010 which reduces strength of materials. Still using as is, is a quick start. Using the my DCT’s for F7 timber, a 290×90 timber is just short of being strong enough: so when strength of timber is reduced to As1720:2010’s requirements, it is unlikely to be adequate. So have a problem, since rule of thumb is ridge boards, fascia boards and hip rafters are to be sized 50 mm deeper than common rafters, and already using the largest timber for the rafter. The largest timber we can use for the rafter is 290-50=240. The DCT’s are also released combined with tables for collar-tied rafters used for canopies, with a 22 degree roof pitch, with the largest span being 9m if and only if can get a collar-tie timber larger than 6m. The current situation the pitch is less than 22 degrees and span of 8.9m. Such shallow truss means higher collar-tie force. Rough check on collar-tie force is bending moment divided by depth to collar-tie F=M/d: a high force in a long collar-tie means it is likely to buckle and therefore needs to be restrained from buckling. Past experience also indicates council likes the collar-ties to be designed for bending subject to an imposed load of at least 1.1kN: this is to allow for people standing on the collar-tie during construction, future maintenance or otherwise just swinging and messing around on the tie, or simply hanging several large hanging baskets from the tie. So we have now “jumped the gun”. As I have already gone from simply supported beam not being adequate, to strong suggestion that a collar-tied truss not adequate. Stepping back, the first calculation indicated that the rafter is not suitable as a single span beam. Didn’t expect that it would be as timbers seldom connected with rigid moment connections at the ridge: they could be but they seldom are. The most common connection at the ridge is a pinned connection. The pitched roof can be formed by two rafters, one propped against the other, no beam is required at the ridge. Different types of roof structure I have discussed before: Doubly Pitched, Gable Roof Structures, enclosed buildings and canopies. Now assuming the rafters are propped one against the other the span is no longer 8.9m but reduced to 8.9/2=4.45m, and so the moment reduces to M=wL^2/8= 2.1×4.45^2/8=5.20kNm, we are now getting down to a rafter around 240×35 F7,it is now seemingly feasible, and contrary to the canopy tables. However assessment is ignoring member capacity which is much less than section capacity (phi.Mb<phiMs). As a quick check, can just take 25% of the section capacity: so 0.25×5.38 = 1.34kNm and so the rafter no longer looking feasible. Or 0.25×20.18 = 5.04kNm for the largest timber makes it all look infeasible again. But still only working with rough estimate. As an assessment exercise could stop here, and declare that the proposal is structurally inadequate. But very few people have need of a certificate declaring something is inadequate. Most people want to know what is adequate, and if something has been declared to have been assessed and found adequate, then we cannot simply stop. We therefore have to continue with further iterations to refine our model. Sure we could dive straight into a 3D structural analysis from the very beginning: but doing so is not really appropriate. We need a guideline, a datum, so that we know the 3D analysis is on the right path, and thus hasn’t got some strange error in it. So we do the analysis progressively. The two propped rafters don’t need a ridge beam to half the span, however the propped rafters have large horizontal reactions at the base which are applied to the face beams and the support columns. To reduce these horizontal deflections we can install a tie beam at the support height, a tie beam above the supports and/or a ridge beam. A typical house roof installs the tie beam at the wall height and is provided by the ceiling joists. A typical canopy installs the tie-beam above the supports typically at 1/3rd the rise of the roof. The force in the tie beam imposes an additional moment in the rafter. Thus the moment in the rafter increases and therefore need a larger rafter than thus far estimated: thats a problem as seeking to make the rafter smaller. But now have a more complex model, and either have to sit down and draw some free body diagrams and work out some equations to verify that the rafter behaves as a double span beam: or otherwise use 2D/3D structural analysis software to numerically conclude such condition. The software I use is Multiframe 4D. The reason for the more complex analysis is that no longer simply dealing with a beam, for which can simply use published or derived beam formulae. Now have series of members connected into a triangulated frame, each member has bending moments, axial forces (tension or compression), and shear forces. The values of these action-effects vary along the span of the members, and the maximums are no longer at midspan, and additionally need to know the reactions at the supports so can design/check the supporting framework and design/check the connections between members. Getting all these numbers is faster with software, and general purpose software is the easiest approach to the situation. Sure can sit down and work out the equations for the system, and have done that for the symmetrical collar-tied roof truss. The equations are presented in Technical Notes: Timber Canopies, carports, pergolas and verandahs whilst a spreadsheet for determination of forces, member design and connection design is available here: Spreadsheet for Structural Design of Timber Gable Canopy. However the neither the tables nor the spreadsheet is not suitable for the current situation: the tables are for the wrong pitch and wind loading. Whilst the spreadsheet is for a symmetrical collar-tied roof truss, without ridge beam. The current situation, I did not fully describe, it is not symmetrical about the ridge line, therefore the rafters are not equal span: additionally now adding a ridge beam. Working out the equations and building a new spreadsheet is far more time consuming than using Multiframe: and such structural form doesn’t occur frequently enough to justify building a spreadsheet to get answer faster than multiframe. Still can still use the existing spreadsheet to get a quick estimate. Clearly using such spreadsheets a design or assessment can be made rapidly, and that is what salespeople do working for verandah suppliers. But if structure falls outside the capabilities of the spreadsheet or other software they use, then the salespeople cannot get a solution in a few minutes talking to a customer. The benefit if such spreadsheets is that the results of the analysis: the design action-effects can be linked into the calculations for member design and connection design. If use software like Multiframe, then limited in the materials can use for the members. In my case I have modules for steel to AS4100 and cold-formed steel to AS4600. Though traditionally used Microstran which had no AS4600 module, and before that our own plane frame analysis software which has no design modules. So member design/checks I traditionally do outside the analysis software using spreadsheets. I use the spreadsheets and built-in design modules as checks one against the other. Connection design I always do outside the analysis software as no design modules available. Design actions are also calculated outside the analysis software. Thus if have to use Multiframe, it represents a major bottleneck to the assessment process, as all the calculations are not connected. For example say that frames at 1.167m is no good, to get the purlin to work I need frames at 0.6m. With simple beams this is just an adjustment to load width. Can easily set up spreadsheets where by load width and all dependencies are automatically recalculated for simple beams. If use Multiframe for analysis of 2D frame, then need to recalculate all the loads for each loadcase, then input these new loads into multiframe. If use 3D analysis then have to draw additional frames at different spacings in Multiframe, recalculate all the loads and input them into Multiframe. Though with a 3D model can use load panels to automatically convert area loads into UDL’s along beams. But need to adjust the load panels to apply the area loads to each of the new frames. Thus with a 2D model have to adjust the loads, whilst with a 3D model have to adjust the dimension and geometry (redraw the model) and adjust the loads. To continue this description of process I need to get some Multiframe screenshots, which is on another computer (an older Windows XP netbook): which currently constitutes another bottleneck in the process of having to use Multiframe as it won’t install and run on Windows 10 and the netbook screen can be too small in some situations. Since the software seems to have largely disappeared since Bentley took over the company that supplied, I am on look out for alternative software. Though probably go back to using our own 2D frame analysis, and add design modules to it for steel, cold-formed steel, timber and aluminium. As well as add modules to auto generate models for the common structures for which we typically do assessments. To achieve speed of assessment we need these rapid model generators, along with quick calculators. But any change to the number of parameters and the existing models become invalid and new models need to be developed. So it is a difficult task attempting to be one step in front and have appropriate parametric models available for quick assessment. Without a parametric model than have the long haul either with pencil and paper, or with general analysis software like Multiframe. So the purpose of the current exercise is to show the “long haul” that results when step outside the scope of the available parametric models. Since I need to get the screenshots I will continue the discussion in a an another post.